Toyota today announced it will begin fixing accelerator pedals in all of this week's 18.4 billion-gazillion (approx.) recalled vehicles with a "precision cut steel reinforcement bar." Details below. Toyota claims they've finally pinpointed the issue that could, on rare occasions, cause accelerator pedals in recalled vehicles to stick in a partially open position. 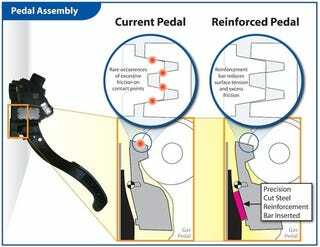 The issue involves a friction device in the pedal designed to provide the proper "feel" by adding resistance and making the pedal steady and stable. The device includes a "shoe" that rubs against an adjoining surface during normal pedal operation. Due to the materials used, wear and environmental conditions, these surfaces may, over time, begin to stick and release instead of operating smoothly. In some cases, friction could increase to a point that the pedal is slow to return to the idle position or, in rare cases, the pedal sticks, leaving the throttle partially open. Toyota's solution for current owners includes a precision-cut steel reinforcement bar being installed into the assembly that'll reduce the surface tension between the friction shoe and the adjoining surface. With this reinforcement in place, the excess friction that can cause the pedal to stick will supposedly be eliminated. And, hey, why not also get your floor mat fixed while you're in getting yer pedals fixed.